Trixie81: Unfortunately the village sign has gone and no one seems to know when it will be back if at all. 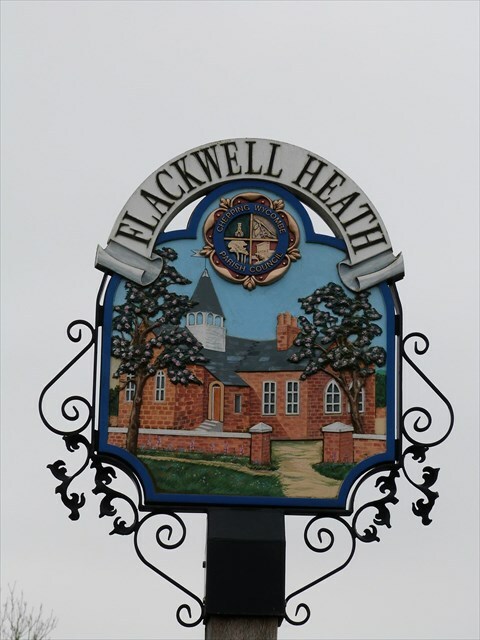 Flackwell Heath is a village of about 6,000 people (1991 census) situated south east of High Wycombe, along the top of a spur of the Chiltern Hills at a height of 450 feet (150 metres). What is known as Flackwell Heath today was in fact, four villages, Flackwell Heath, Northern Woods (or North-End Woods), Heath End and Sedgemore. The original existence of these villages probably came about as a result of people crossing the Chilterns' spur from one valley to the other, either for work in the mills of the Wye valley or delivering goods to the Spade Oak wharf for shipment by boat along the Thames. 1. Find the bus stop, two routes stop here EA and E6. 3. Walk a sort distance and find the road signs on the nearby roundabout, C is the combined distance to Marlow and Wycombe . If anybody would like to expand this series please do. I would just ask that you let "http://www.geocaching.com/profile/?guid=52cc3744-888f-4b29-a97b-2b14c01b853d&wid=37b539c6-894c-42d6-bbb6-d2bbd78b220c&ds=2" Smokeypugs know first so they can keep track of the Village Sign numbers and names to avoid duplication. It is a short walk to GZ where there are good views across the surrounding countryside.